Summary: The project will replace outdated, deteriorated and nonexistent beachgoer guideline signs regarding sea turtle interaction and conservation. The replacement signs will be installed at all of the Central Area Parks and Recreation's 25 public beach access sites and at 20 sites in the South Area that are missing signs. The signs in the Central Area will be updated to match the current signs being used by South Area Parks and Recreation and the Archie Carr National Wildlife Refuge. 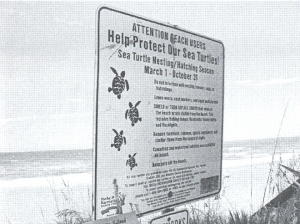 The goal of these signs is to educate beachgoers on proper behavior, while on the beach, regarding sea turtles and their conservation. This will help to decrease disturbances of nesting sea turtles and hatchlings by the general public visiting the beach. Results: The signs were installed by Parks and Recreation maintenance staff over the summer months. Riverwalk Park staff conducted effectiveness surveys over two weeks at various beaches where the signs were installed.